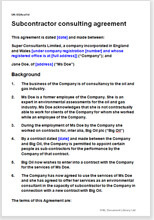 This document is suitable for use by any consultancy business. So often, you need to take on a specialist, for a particular project or to make up a team. This agreement is your contract with the self employed person whom you bring in to help. Using this agreement will help you to avoid a challenge by Australian Taxation Office as to the employment status of your sub-contractor. Of course your industry sector affects the work you want to instruct your consultant to do. But this is a legal document, not a specification for work. It is drawn to protect you, the main contractor, but should also be acceptable to your sub-contract consultant. This is an “umbrella” sub-contract, set up for the possibility of future assignments under the same terms. That way, if you want more work from the same consultant, all you have to do is define it and refer to this agreement. Even if you expect never to re-employ, you do not have to delete anything on that account. The consultancy sub-contract provides for the specification of work to be placed in a schedule to this agreement on the first time it is used. All later assignments of work will automatically be subject to this agreement. There is little statute law in this consultancy agreement. It depends on basic sub-contract law and tort. However, the structure and the contents of the agreement reflect the latest thinking on what is needed to protect a business from theft of its intellectual property. "Clear info and documents. just to fill in some info and ready to use. Great!"